One year ago Germany decided to quit producing nuclear energy by 2022. Since nuclear power plants are a central pillar the German energy mix, contributing some 22.5% to the entire electricity output in 2010, this means that until 2022 the equivalent of 140.6 TWh (2010) has to be replaced by other sources. This is a minimum estimate ignoring increase in consumption. Already at this moment Germany begins to face the consequences of last year’s decision. As nuclear plants are successively being phased out, more strain is put on other sources, in particular renewables. In addition, the power grid is experiencing severe tensions as more controllable sources of energy are being replaced by less controllable (and predictable) ones. Especially the latter is a constant, or rather growing source of trouble. One the one hand, it’s a clear goal of German policy to increase the share of renewables substantially. On the other hand, it seems implausible to be able to replace the entire nuclear bloc by wind and solar capacities only. Thus, it appears inevitable to commission a number of conventional, i.e. thermal power plants which are supposed to act as a backup for the fluctuating input from e.g. wind farms. In my view, it is pretty obvious that wind will be the main source of renewable energy in the future, considerably outnumbering all other renewable sources taken together. 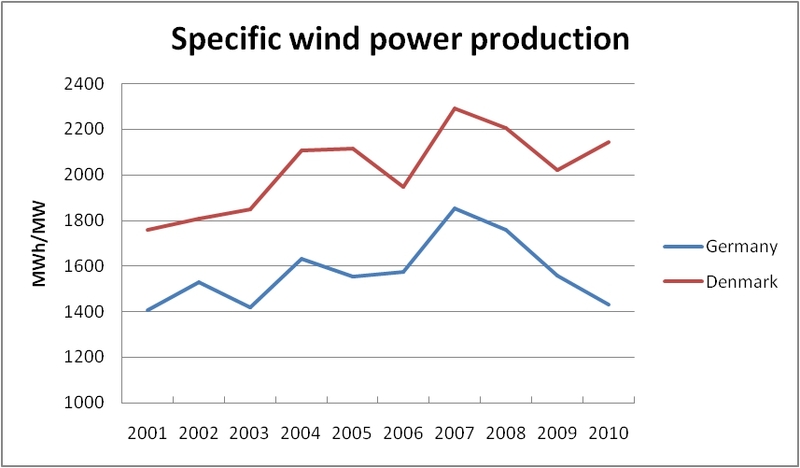 In 2010 the total capacity of German wind farms amounted to some 27190 MW which produced some 36.5 TWh. Taking into account the average specific output of wind farms as calculated in one of our previous postings we may estimate the extra capacity needed in order to fill the gap. Then we could show that the average output of wind power installations amounts to some 1600 MWh annually per MW of installed capacity. Having these figures at hand we may easily estimate how much extra wind capacity is needed in order to replace nuclear in its entirety. 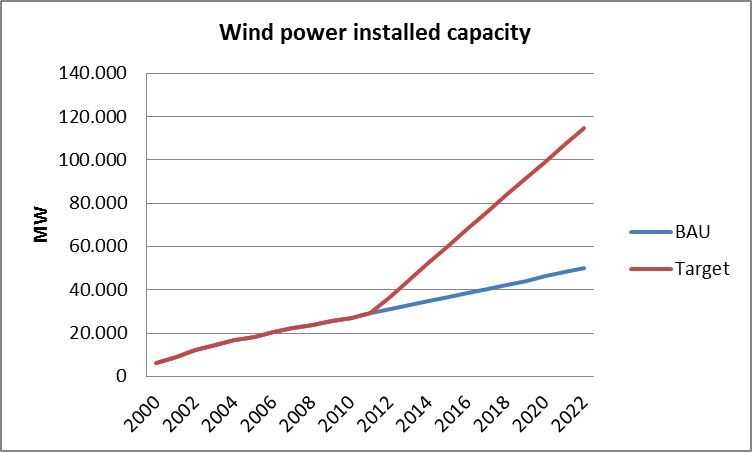 Thus if wind power is supposed to be the only substitute (which is certainly an oversimplified approach) it would mean that Germany needed almost 88000 MW of additional wind power by 2022, thus an extra three times as much as was installed up till 2010. This in turn would mean that the country needed more than 115000 MW in wind turbines by the time the last nuclear power station is decommissioned. Between the year 2000 and 2010 an average of 2000 MW was commissioned annually, in total some 20000 MW of wind power. Extrapolating this trend to 2022 implies that some 24000 MW of new capacity could be added to the grid until D-day. However, what is needed is almost four times as much. Thus the annual growth rate should be close to 7800 MW. Even if we assume that wind will only replace half of the nuclear output, a growth rate of about 4000 MW annually would be necessary, i.e. twice as much as has been the case during the boom period 2000-2010. The figure below shows two different scenarios for Germany´s wind power capacity. The business-as-usual scenario (BAU) is based on the assumption that wind capacity will grow at a rate of 1900 MW per year, which is equivalent to the increase in 2010. 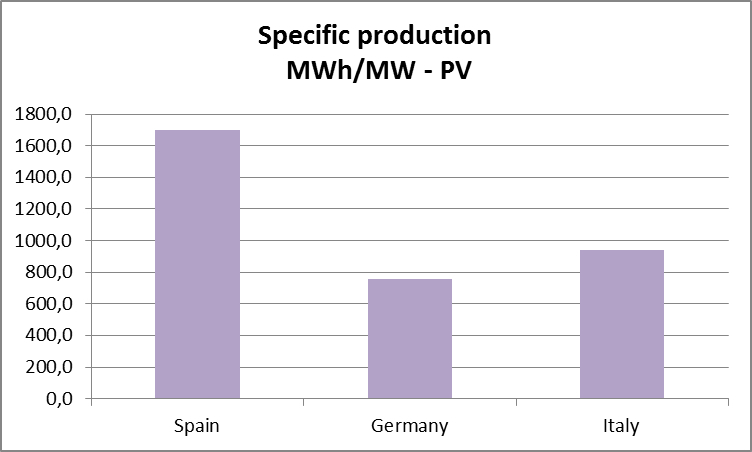 The Target scenario on the other hand assumes an annual growth of 7800 MW which would theoretically be sufficient to replace Germany´s entire nuclear production as seen in 2010. Total installed wind power in Germany. Given that there is considerable resistance among the population against onshore wind farms, it is indeed hard to see how this can be achieved. In addition, as subsidies for renewable energies are becoming a serious burden for consumers, they are likely to be reduced in the future. This in turn may jeopardize further investment in wind power, and thus even the more conservative BAU scenario may, in fact, be too optimistic. As a consequence, other energy sources are desperately needed if Germany wants to maintain her standard of living. We will come back on this issue in another posting. Most European countries are now investing into wind energy. Only very few of them may be considered as “old” players in the field. 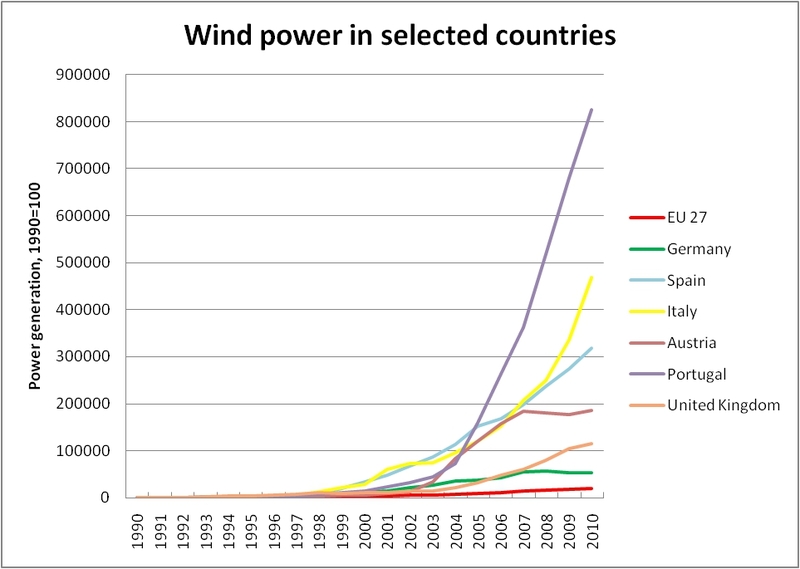 Among those which used wind power already back in 1990 were Spain, Denmark, the Netherlands, Belgium and Sweden. As indicated these are average values over the first decade of the 21st century. Needless to say that these mean values are rather virtual figures since in reality the availability of the driving force behind the facilities, i.e. the wind, is rather varying by nature. By the way, these figures have been calculated using our specific model which enables us to smooth out distortions due to capacity changes during each year. 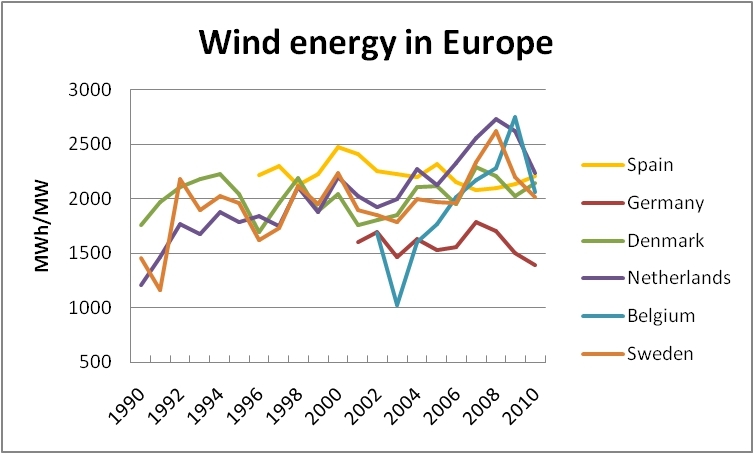 The graphics below shows the evolution of wind power in those countries since 1990. The missing data points for some countries refer to the fact that the quality of those data does not fulfil our standards. Thus, we omitted them rather than doing guesswork. 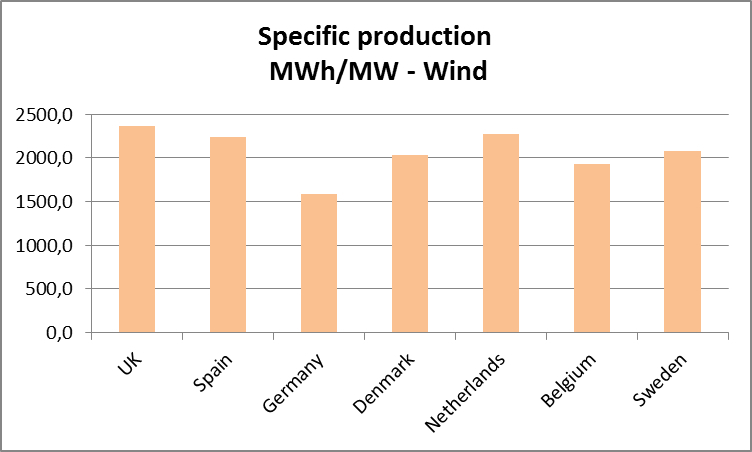 Specific output of European wind farms in MWh per MW installed capacity. It is quite remarkable that the mean performance between different countries can vary a lot. The most striking feature, however, is that Germany is seriously underperforming when compared to the leading producers in Europe. This may well indicate that selecting the location of a wind farm may not always have been the best choice. Other countries have apparently done a better job. Denmark is one of the leading producers of wind energy in the world. This is true not in absolute, but in relative terms. Being a small country Denmark simply does not have the capacity to compete with larger countries such as Spain or Germany when it comes to total output. The share of wind power in the electricity grid was 20.1 % in 2010. Portugal and Spain, the numbers two and three in the ranking, had shares of 17.0 and 14.6 %, respectively. 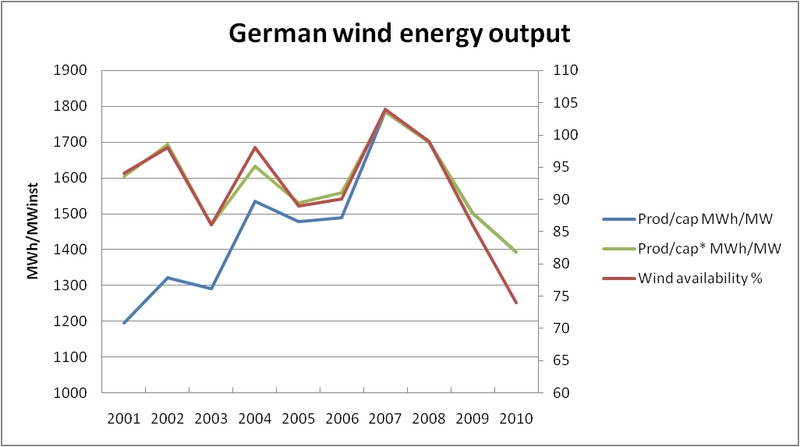 In a previous post we examined the specific performance of German wind farms. Now we will compare those findings with a similar investigation for Denmark. Fig. 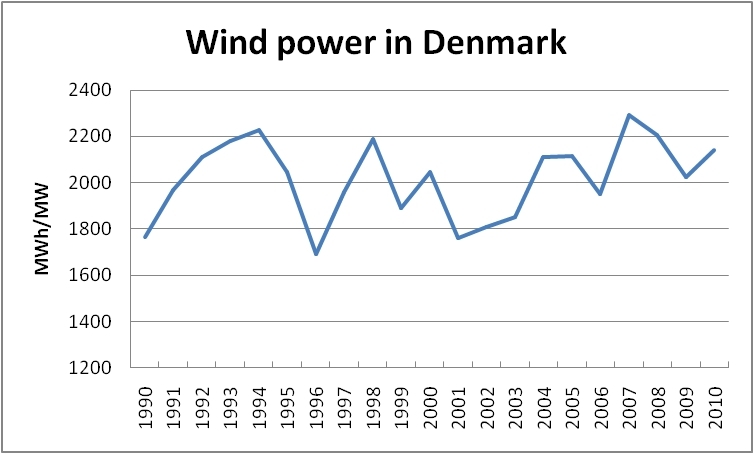 1 shows the specific output of Danish wind energy in MWh/MW between 1990 and 2010. As usual we have applied our model to smooth out distortions caused by the building up of new capacity over a year. The remaining fluctuations are due to varying wind availability. Fig. 1 Specific output of Danish wind farms in MWh/MW installed. Fig. 2 gives a direct comparison between Germany and Denmark for the period 2001 till 2010. One striking feature of this picure is that Danish performance is consistently and considerably higher than the German one. On the averge, Danish facilities have an almost 29 % higher output in MWh/MW installed. Thus, their efficiency and productivity are much better than the ones of their southern neighbour. Fig. 2 Specific output of wind farms in Germany and Denmark. The average performance of German facilities was 1571 MWh/MW whereas Danish wind farms produced some 2026 MWh per MW installed. One of the reasons for this discrepancy may lie in the fact that Denmark has a higher share of offshore wind farms which tend to have a higher efficiency than the ones based on land.